River Grove Books, 9781632990587, 184pp. - Do you feel burned from dating the same type of person over and over again? - Are you tired of endless dating that never seems to go anywhere? - Do you always start out with Mr. Right, only to watch him turn into Mr. Wrong? In The No-No List, psychotherapist Venus Rouhani offers a radical new perspective on the dating game. That person who makes your heart throb, who has your sense of humor, and who shares your love of travel could also have a temper, wandering eyes, or a need for control that-as much as you want to ignore it-will rear its ugly head later in the relationship. 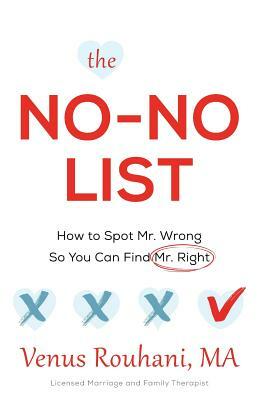 Fear no more The No-No List will equip you with the tools to know which personality traits are deal breakers for you and will help you spot the red flags, even in a brand new relationship.